“Let us never lose this vision of the faith,” said Pope Benedict XVI, when he retired five years ago, on February 28, 2013. He spoke words that are at the same time his roadmap and, in as much as Peter, the roadmap that he indicated to the whole Church and to each baptized person. Three times, he expressed his love of the Church, the Bride, and of humanity. On February 27, 2013, during the Wednesday General Audience, he addressed a large assembly in St. Peter’s Square; then the Cardinals, the following day and, finally, after a helicopter trip, skilfully transmitted live by the Vatican’s television, he spoke some improvised words to the moved crowd, from the balcony of Castel Gandolfo. In that Year of Faith, he posed an immense act of faith, and he indicated to all as roadmap this path of faith. “Dear friends! God guides His Church; He supports her always, also and above all in difficult moments. Let us never lose this vision of faith, which is the only true vision of the path of the Church and of the world. May there always be in our heart, in the heart of each one of you, the joyous certitude that the Lord is at our side; that He doesn’t abandon us, that He is close to us and envelops us with His love. Thank you! 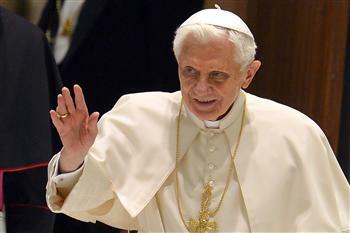 On retiring, Pope Benedict “instituted” in some sort the “retirement” of Popes, under the twofold sign of “respect” and “obedience” to his Successor. He said simply: “Thank you and good night. Thank you to you all.” As an echo, on March 13, his Successor said simply: “Good evening” from Saint Peter’s loggia of blessings.